This may just be the best photography / traveler / ski-work-life-play backpack ever! Peak Design have nailed it with their Everyday Backpack. 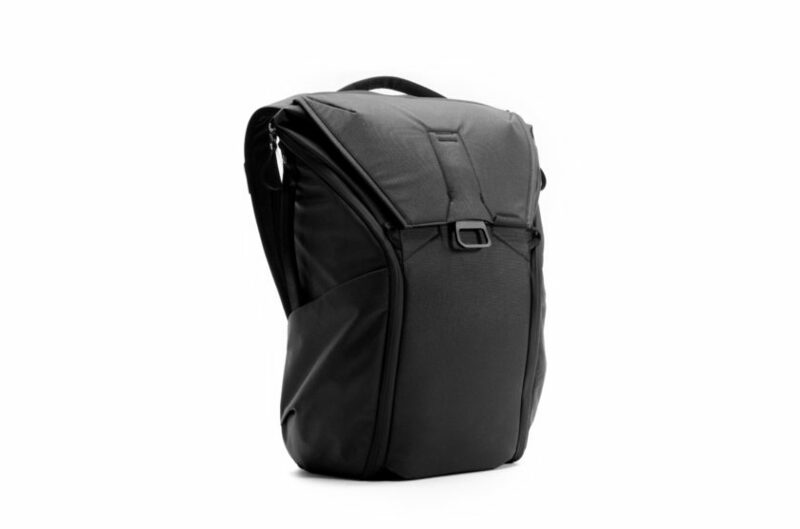 Whilst it’s designed to cater for the adventuresome photographer, I’m loving this backpack so much I have now replaced all my other backpacks with this ultimate all-in-one backpack for my work, sport, travel and of course photography. I came across Peak Design on Kickstarter back in mid-2016. But it wasn’t until this year that I need to upgrade from my current camera-pack that I remembered them and started my google searching to hunt them down. The results of my research into Peak Design was impressive. They originally launched their camera-bags on Kickstarter as early 2011. Since then they have successfully launched over 20 products for the photographer, commuter and traveler on Kickstarter. Here’s a video of their Everyday Backpack from Kickstarter . Note: They are no longer available on Kickstarter, this is just a great video to show you about their backpack. I had two size choices, a 20L or a 30L backpack. I choose the smaller one. 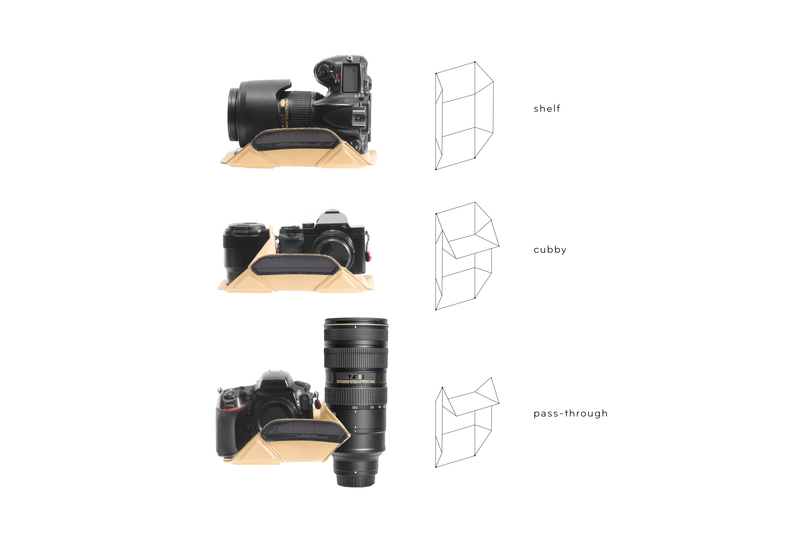 My inner-photographer nerd was super happy with their internal, endlessly configurable FlexFold™ dividers that organize and protect several lenses and my camera body, and left me enough space to also pack laptop, a heap of my personal belongings and some clothes. 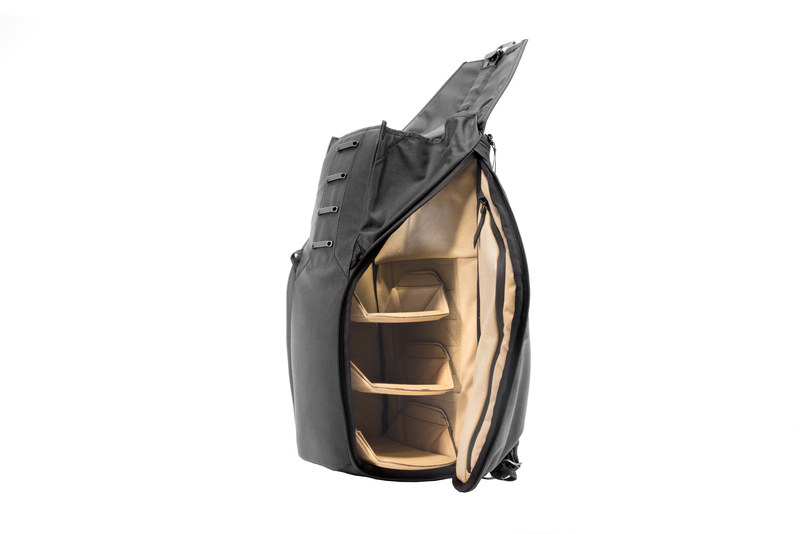 The Everyday Backpack offers so many impressive features including, three access points to get the bag, the top and both sides. From either-side I can access my camera kit from dual weatherproof zippers, and each flap also comes with a zipped waterproof sleeve with pockets to hold more gadgets than I currently own. To access from the top I just unclip their patented no-­look, one-­handed, top hatch closure. (MagLatch™). A weatherproof 500D synthetic canvas shell on the exterior of the bag sheds water and provides durability, while a minimal amount of dangling straps, adjusters and tails help to maintain a clean, elegant look. The outside straps tuck neatly into the outside pockets that can easily hold mono or tripods and my water bottle. The straps also extend across the back and can easily hold a drone. (still on my shopping list). I am more of the weekend warrior hobbyist photographer and I am loving using this pack for my daily work-travel-play life. 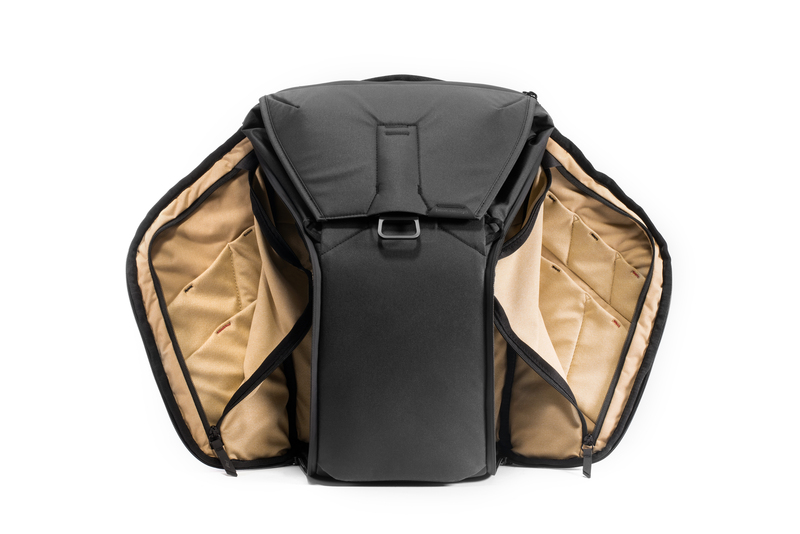 I simply remove the internal FlexFold system that holds and protects my camera kit (it’s attached with Velcro) and I have a spacious, well designed and stylish backpack that is super comfortable and light. It’s perfect for work as it’s 15” laptop compartment is padded and has a small pouch that carries my phone, charger, pens, etc. Both the sides that open up to access the inside also have sleeves and ample space for a huge array of gadgets and stuff (we all have stuff). I’m loving their magnetic elastic lock system. It lets me expand my backpack for larger loads and looks as good as it functions. The Peak Design Everyday Backpack comes in two sizes and four colours. For more information, photos, distributors and pricing check out their website.